I can’t believe January 2018 is already more than half over! I’d originally intended to write a year-end/New Year blog on either New Year’s Eve or New Year’s Day, but then various projects I was working on those days took longer than expected. Then January 2nd arrived, and it was back to the day job, while trying to progress a recording project in the evenings and on the weekends. Oh, and the flu struck (I’m still not fully recovered from that). Of course, if I’d known exactly what I wanted to say, I might have found time to whip a blog entry out in between the cracks, though, to be fair, lots of other stuff that was better-defined also took a back seat to the recording project and day job. Speaking of the recording project, while I always tend to take a while to make a new recording, this one (it’s still in the works at the moment) has been taking even longer than usual due to the Who Moved My Cheese? factor injected by using a different recording program. I’d written in my previous blog entry about my thoughts on the demise of Cakewalk, the software company behind my longtime recording software, SONAR. I’d decided at the time to experiment with other DAWs (Digital Audio Workstations), with the idea of educating myself on the alternatives in case SONAR does not remain viable in the long term. Due to some time-sensitive crossgrade deals, I spent most of my spare time in late November and December trying out several of the alternatives. I eliminated one, but ended up purchasing three (MAGIX Samplitude Pro Suite, PreSonus Studio One Professional, and Steinberg Cubase Pro) to take advantage of year-end deals and buy myself time for longer term evaluations. When it came time to start my first non-SONAR recording project, I went with Cubase since it happened to be the DAW I was experimenting with at the time. (My general idea is to alternate between DAWs as I make different recordings until such time as I decide which one I’d like to make my primary DAW.) I think I’m starting to get the hang of Cubase, at least in the areas I’ve touched on in this project, but I have to say it was anything but intuitive to me, even after reading through much of the 1,000-plus page Operation Manual. Prior to getting to my DAW evaluation project, I spent the better part of three months of my non-day job time focusing on planning a photography-centric trip to Costa Rica, making the trip, then sifting through, and editing some highlights of, my photos. 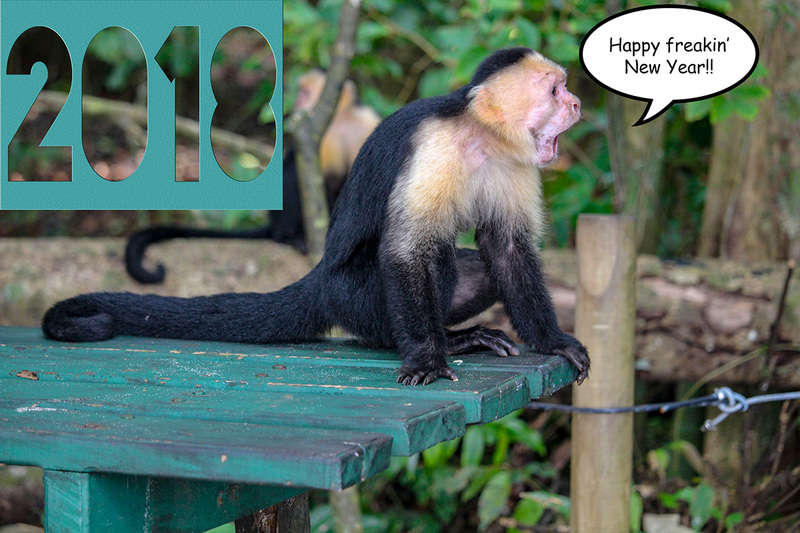 For example, the photo at the top of this blog entry is one I took in Manuel Antonio National Park, near Quepos, Costa Rica, of a capuchin monkey with a heavy dose of attitude. (If you’d like to check out more highlights of my Costa Rica photos, you can check out this photo album on Facebook.) While the trip was nominally a vacation, it took a good deal of work in planning, beefing up on my Spanish, then working with the resulting photos upon my return. It became a decided highlight of the year for me, not only due to the trip to an exotic environment and the opportunity to see animals I’d only seen in zoos before close up in the wild, but also because of some of the philosophical thoughts it sparked, how much further I got in my Spanish fluency (mostly after the trip, as the trip inspired me to keep beefing up in that area), and how much I learned about using Photoshop CC (I’d been a longtime user of Photoshop Elements) through working with my photos upon my return. In some senses, it was like having gone back to college for a quarter, albeit without the exams. In some ways, the year was a slow one on the musical front. I released five digital singles, two of which were brand new recordings and three of which were remixes of recordings I’d made several years back, and co-wrote two new songs (one of which is my current recording project). In other ways, though, it was a pretty active year on that front, for example with my getting out there to make live music in various public contexts 96 times, which averages out to once every 3.8 days. Not too shabby for a middle-aged guy with a day job. Perhaps most interestingly to me, during the second half of this year I began working with a new musical collaborator, mainly on the live performance front to date, though she was also my co-writer on one of the songs I wrote this year. I’ll avoid mentioning names for the time being, but it’s been fun working up some new material with a kindred spirit, and we’ve both been very pleased by the reactions to our joint performances. Perhaps more interestingly still, we were joined by another very talented singer for a few songs during a Christmas Eve performance, and the vocal blend just felt like magic. All three of us became intrigued by the potential of working together further, and we’ll begin checking out that possibility in the very near future. That has me very excited about musical possibilities for 2018. Looking back at 2017 as a whole, I started the year focusing on the recording front, releasing three singles in the first three months. I might have made it four singles in four months had it not been for some household emergencies that cost me a large amount of time and money in April, but I did get a fourth single out in May. A combination of family events and getting back into photography, including learning a new photo application, distracted me for a bit, and my fifth and final single for the year didn’t come out until mid-August. My detour for the Costa Rica trip planning began not long after that, then DAW replacement considerations kept me occupied the rest of the year (and still today, though at least now in the context of working on some new recordings). In parallel with all that, though, I was performing, including in some new venues and contexts, and performing live music has always been one of my greatest pleasures. All in all, if I ignore certain aspects of the year (you know, national politics, day job, etc. ), 2017 was a pretty good year. Perhaps more importantly, though, it’s left me excited about possibilities for 2018, and that’s a great way to start a new year. Happy 2018!